The Ph.D. is concerned with the generation of new knowledge. Thus, it encompasses not only the learning of certain bits of fact or processes, but also synthesis, analysis, and imagination – the forming of questions, thinking about issues, and communicating new ideas. The IS PhD Program faculty has agreed that face-to-face interactions among faculty and students, and among students, are vital to building an intellectual and social scholarly community that fosters a spontaneous exchange of ideas in a mentoring environment. For this reason, the program is primarily residential with an emphasis on flexibility and individualization. Regular one-on-one advising accommodates the widespread backgrounds and interests of students by helping them develop programs tailored to their own interests. Although the 12 credit hours of required introductory courses are delivered on the Denton campus, most other courses are offered in online format, and students may also transfer courses taken at their local universities to UNT, with advisor approval. Students must complete a total of at least 18 credit hours of cousres in two to three (2-3) consecutive long semesters in order to meet the Graduate School's residency requirement. Preparation/Coursework: Minimum of 48 graduate credit hours for students with completed Master's degree; minimum of 60 graduate credit hours for students without completed Master's degree. Coursework can be completed in 2.5 years of full-time study or extended over a longer period depending on your own personal goals. Qualifying examination: Students will take the Qualifying Examination while enrolled in INFO 6660 Readings in Information Science. The examination will include a public defense, which includes presentation of dissertation topic. Students who pass qualifying (by earning an A or B in INFO 6660) are admitted to candidacy and begin dissertation research, during which they enroll in a minimum of 12 dissertation hours. Typically, the dissertation requires an additional 1-2 years. Dissertation proposal: Detailed description of the research to be conducted, presented in a public defense. During this and next (final stage) students take a total of at least 12 dissertation credit hours. Dissertation: Final research report, presented in a public defense. 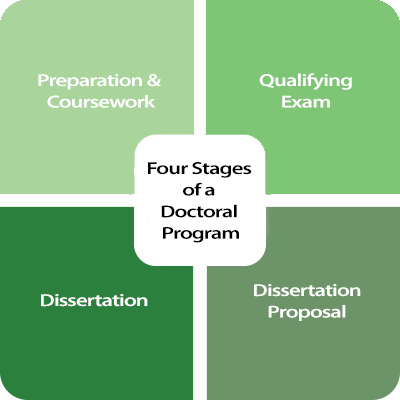 There is considerable variety among institutions as to the details of preparatory and qualifying endeavors that are considered the minima needed to successfully construct a dissertation. Within the Information Science Doctoral Program we have formulated the minima as presented in the handbook and on the Degree Plan. These have been constructed in accordance with the general doctoral requirements set forth by the University of North Texas in the Graduate Catalog. Preparation, in the form of course work, independent study, reading, writing, and the forming of collegial mentoring relationships with appropriate faculty enables exploration and focusing expertise in information studies. Note that preparation is not simply an extensive set of courses; rather, it is a holistic process of study, socialization, contemplation, and production. Preparation, thus, cannot be mere accumulation of course credits. It is best designed and refined in close collaboration with faculty mentors and the Coordinator of the Doctoral Program. The qualifying process provides the opportunity to demonstrate readiness to enter the research phase of the scholarly life. Engagement and passion for the field are announced and honed by the period of preparation, by the eager acceptance of the rigorous challenges, and by interactions with mentors. The particular process designed each individual in pursuit of the doctorate is designed to demonstrate sufficient understanding of basic concepts, sufficient ability to synthesize and analyze, and passionate desire to pursue a significant new question so as to be able to write a dissertation. Further, the awesome responsibility of the doctorate requires that society have measures by which to judge those who would hold the Ph.D. The Qualifying Experiences provides one such measure. The dissertation is the synthesizing and analyzing project that demonstrates to the academic community that one is prepared to conduct independent research and make it available to the broader community. It is also likely to be a presentation of the anticipated research agenda of the writer. It is the dissertation that demonstrates the capacity to conduct independent research. It is the dissertation that is judged by a faculty committee. It is the dissertation that proves worthiness to hold the doctorate. It is on the basis of the dissertation that the Ph.D. degree is granted by the university. In summary, the preparation phase hones individual abilities and insights; the qualifying phase focuses these abilities and insights on a topic and demonstrates them to the faculty of the program; the dissertation phase generates new knowledge and presents it to the broader scholarly community.